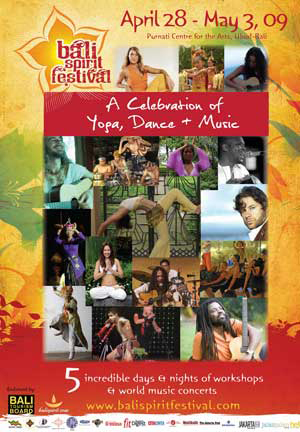 Calling out to all Malaysian yogis, the international annual celebration of yoga, dance and music is here again! This year’s Bali Spirit Festival will be held from 28th April to 3 May 2009 in the stunning grounds of Purnati Centre for the Arts located in Ubud, Bali. Bringing together yogis, enthusiasts and talents from all over the world to celebrate and honour the art of yoga, music and dance; the festival also provides a global platform for exchange of spiritual learning and creativity. The event which is co-founded by Meghan Pappenheim, I Made Gunarta and Robert Weber will also showcase the beauty and unique creative talent of Bali and Indonesia. For more information on the Bali Spirit Festival 2009, visit their website here.